Welcome to the official website for Shuga! A flexible and open skin format designed for web applications. If you are interested in supporting my work financially, you can do so either via PayPal, Bitcoin, Monero, or Ethereum. 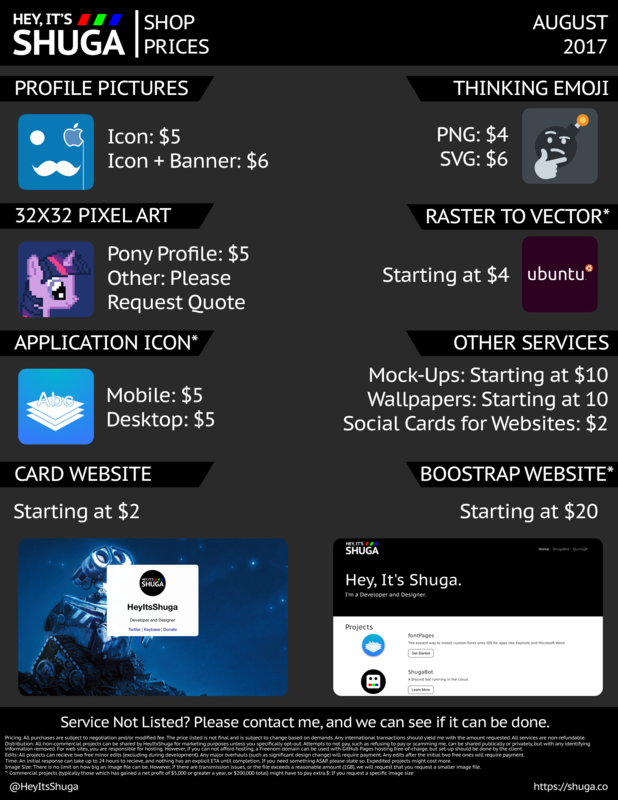 Alternatively, if you want to purchase any of my services, the pricing sheet as of August 2017 is available for download here. Please note that my services may not be available at all times. If you wish to contact me, here are some ways to do so. If you wish to contact me via PGP, email heyitsshuga [at] shuga [dot] co and use my public key here. My signature is 252E 1A85 7E53 DDAA 4A7C B614 7E2F B28A 0B92 585E.